You've worked hard to perfect your rich, decadent cupcake and muffin recipes, so why not showcase your work accordingly in a neat, sanitary fluted baking cup? Simply line your muffin pans with these mini muffin baking cups for easy clean-up and a ready-to-go presentation. Each cup measures 1 1/4" x 7/8" in size. For extra versatility, you can use these cups to hold your other decadent treats like cake pops, chocolate covered strawberries, and your signature candies! These White Fluted Baking Cups worked perfect for our home made chocolates! They really made the product look fancy when paired with the 7 3/8" x 3 1/2" x 1 1/4" white 3/4 lb. 1 piece candy boxes with the rectangular window & the box pads that we bought to go with them. I LOVE these. They come apart so easily, unlike some baking cups that I've purchased in the past. They work nicely for our mini cupcakes. They are not extremely thick, so if you need something thick, these aren't for you. They fit perfectly in our mini cupcake pans. An added bonus is that they fit perfectly in our budget - great price! These are the perfect size for mini cupcakes! They bake big enough to give a small 2 bite size cupcake, which is perfect for sampling. We use these baking cups in our store daily. We serve our chocolate covered strawberries in them. We also use them on the bottom of every gourmet caramel apple we make. I use these for displays filled with nuts/mints and for baking muffin/cupcakes. They are great and look pretty when holding frosted cupcakes on a display table. I have to admit, I was hesitant to order 10,000 of these in case they didn't work out but they have worked out beautifully and I wont have to re-order any time soon. They are great for candies, I have not baked with them but they do separate from each other really well so you don't have to worry about using up 2 or 3 at a time. I am so excited about this purchase. It is such a deal to be able to find mini cupcake liners are such a great price. I love these liners. They are the perfect size for your standard cupcakes. I use these for cupcakes and flower molding. I REALLY LOVE THESE! The shipping process was really fast and I received all in good condition! The quality of the cups it's good and also the materials, good price! These baking cups are perfect when you just need a thin cover on your muffins or cupcakes. They won't stand up on their own, but they work great in mini muffin tins. Perfect size for micro muffins or micro cupcakes. Holds up well in baking process and separates easily from product after baking. Just wish they offered them in brown. I love these baking cups. They fit two tablespoons of cupcake batter and come out of the oven with perfect domes. i will definitely order these again. i LOVE these mini cupcake liners. They fit perfectly in my Wilton 24 mini cupcake liner. They are thick and bake with batter beautifully. The peel beautifully as well. I would highly recommend this product. I bake and freeze mini cupcakes and the liners stay fresh! These baking cups are perfect for mini muffins, mini cupcakes and even for holding truffles or cake balls, cake pops (without the stick). They don't flute inwards when the batter is added and they fit most mini muffin tins. Large quantity for a great price as well! These are great little baking cups. I use these for multiple things, including mini cupcakes and mini shortbread cookies. These are a great value and good quality! These mini cupcakes liners are the best. We use them everyday in the restaurant for our cupcake samplers. The kids really enjoy them because they are just the right size for them. These are well-priced mini cupcake liners – even with the horrendous shipping fees to Hawaii! I use these mini liners for cheesecakes and have gone through about 5000 in the last few months. The only reason I'm not giving these liners 5 stars is because they are not grease resistant (as is evident in one of the product pictures). But with the price, I suppose one wouldn't expect them to be. These are the cutest muffin or cupcake liners. They are the perfect size for a standard mini muffin tin. They can even be used to serve small appetizers. These baking cups are great for miniature cupcakes or muffins. They even would be nice for cake balls or truffles. Any bite sized food, really. These mini mini muffin liners fit a pan that I already owned. They make the perfect 2-bite treat. The liners are a nice weight, and they look great. I love these baking cups. They're good for mini cupcakes but I like using them to serve mini cheese balls rolled in pistachios and speared with skewers. These are great for baking mini muffins and mini cupcakes. I also like to set cake pops on them. This is a great price for 1000! These worked great with the mini cupcake pan I ordered also. The customer loved the size and look of the cupcakes. Would definitely purchase again. These are great cups, but they are a touch smaller than a standard mini and as a result don't sit properly in mini cupcake inserts. Please make ordering mini cupcake liners easier!!! I've had to order several different sizes to find the right fit. I think these look great and I like that they're a little tall, it gives an elegant look. The only down side is that they're a little to narrow to sit in cardboard mini cupcake inserts without sliding around, so I'm gonna try a slightly larger size also. These little cups are perfect! I have a standard sized mini-cupcake pan and these fit perfectly in there. They do sit a bit higher than the sides of the pan (maybe 1/8" taller) but I love them! I use them for baking mini cupcakes and brownies bites. Like their larger counterpart, these parchment liners separate easily, and are perfect for a busy bakery! They are the perfect fit for our minis, too! I have been using these bake cups for over a year now. They are the perfect size for my standard cupcakes. The slightly taller sides offer extra space for the perfect crown of frosting. 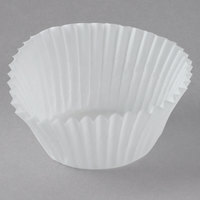 These White Fluted Baking Cup 1 1/4" x 7/8" - 1000/Pack are smaller than I thought. Don't know what what I will do with them. The price is great. These mini liners are absolutely perfect for standard mini cupcakes! They are very sturdy as well. I used chocolate batter in them and you could barely see the batter color through the outside. Will definitely be buying again! These are the perfect size for mini cupcakes! They are slightly larger than the ones you can probably find at your local grocery stores. They separate easily from each other and hold their shape well. If you're not sure on what size to order for mini cupcakes I suggest trying these out. This is a great pack of baking cups. They are easy to separate and fit into my mini cupcake pan perfectly. I just wish there were more color options in this size. Nice mini cupcake liners! They are the perfect size for our mini cupcakes and arrived in a box with absolutely none damaged or smashed. Will definitely be buying this product again! Awesome little baking cups. They work well for baking but also for display and for packaging. They display well and are easy to work with. These are really good cupcakes liners and are auch a good price too. Great product definitely recommend to every one. I will be ordering again very soon. These baking cups are the perfect size for mini muffins and cupcakes. The come off easily from the mini cupcakes and I like the white color to keep all the cupcakes consistent. I love these mini baking cups!! I use them to package my French macarons. They hold up well in the box and they fit perfectly! After buying a mini cupcake pan on here, I realized that I had no baking cups to use the pan with. I ordered these and have been very happy with them. There are a 1000 in the pack so it's safe to say I won't run out any time soon. These all white mini baking cups are perfect for mini cupcakes and brownies. The paper is thin but not to thin. I would purchase again. I have never been disappointed with anything I have purchased from Webstaurant.com. These are the perfect size for making mini peanut butter and coconut chocolate cups!! We use these mostly for displaying finished pastries, and they work well for that. However, they are a bit stiff and thick and have a wider fluting than what I prefer. Perfectly sized mini cupcake cups. These fit in my standard Wilton cupcake tin. The shape is correct, which isn't always the case with baking cups. These are great liners for mini cupcakes. They fit nicely in the pans, and also the mini cupcake retail containers. They don't stick together which makes filling go quick! Perfect size. I use these for chocolate covered strawberries and cake balls. They come stacked, which is great because I just have them on my shelf and and doesn't take up too much space. These cups are really good. I don't know if you can get a better deal on baking cups. They are a good size for mini cupcakes, candies, clusters, etc. They are slightly thin, but I not thin enough for it to be a problem. I will be ordering these again. I used these baking cups for my friends wedding desserts and they were perfect! All of the mini cupcakes and cheesecakes were a huge hit. These white fluted baking cupcakes are great. Just the right size for my cake balls and mini cupcakes. we will purchase these cupcake lines again. I love these mini cupcake line. I used these cupcake lines for cake balls, cake pops and cake bite. Also good for baking mini cupcakes. I am reordering today. Great multi-purpose baking cup and at a very reasonable price. I've used them as baking cups and for candies, portioning out sprinkles etc when baking with children. I plan on using these as cups for my white chocolate covered Oreos I will be giving out as favors, they are a perfect fit. I will also try making some mini cupcakes as that is what they are intended for. Five stars. I use these cupcake wrappers to beat cake balls or cake pops. Quality good for price especially. Also good for baking mini cupcakes but they do not fit well in standard mini cupcake pan. Great mini cupcake liner. They are a little smaller than the ones you purchase in the store. Even though they are a little smaller than the ones in the store, they fit PERFECTLY in my mini cupcake cake pan! Stand up well, no greasy exterior after cupcakes bake. Love this product. These are the perfect little cups for samples! I take them with me to the farmer's market to hold cupcake samples. They have a nice sturdy wall that doesn't collapse. Simple but just the right size to fit in our mini cupcake molds and perfect for use under cookies and brownies. I will be buying plenty of these in the future. I use these mini cupcake liners to hold my bite size cheesecake. The thing i like to use those liners because they are easy to separate, that's really help when i'm in hurry! I'm always running out of baking cup when i'm baking so these are perfect. I use them for making chocolates and mini cupcakes. the size fit my pan perfectly and is really affordable too. Really cost efficient and possibly the cheapest available around. They come packaged in a row wrapped in a paper tube. I haven't baked in them so I can't tell how great it holds up against grease but they're good for holding petit fours. I use these for mini muffins and for all sorts of mini baked goods and candies. Nice cups for a nice price. They separate easily too. These liners are the perfect size for MINI cupcakes! I use them mostly for cake pops because I like how tiny they are and they don't come all the way up the cake pop side. I also use them for mini cupcakes. GREAT product! These are perfect size for cake balls, aka truffles. They display nicely or package very well in a gift box. Come in a small tube, so they stay together! have ordered twice, and will be ordering more. These work great for my cupcake tarts, etc. Or when I am actually baking etc. Great price for 1000 pk, good deal. Will purchase these again. The white cupcakes holders are great. Just the right size. They kind of blend in the the cupcake and the holder is not just bright white. Will re-order. These are a good quality baking cup. Since they are white, they are perfect for all occasions. I like how they come in a convenient cardboard container. We have purchased liners everywhere else (craft stores, grocery stores, other places online), and nowhere comes close to the quality and quantity for the price. Our standard mini muffin cup - perfectly fits the pan and unwraps like charm every time. Love that everything comes crisp and clean in white - my favorite! These are a standard baking cup for cupcakes. We like them and feel they are a good size and height cup for us. They're great. These liners fit a mini-muffin pan perfectly! Great quality and amazing value. I will never buy mini muffin liners from the grocery store again! These are not the "tall" mini muffin liners that you see at some grocery bakeries, these are standard minis. Great liners for anything you need liners for. Great price! Shipping was great and like being able to track the delivery. Securely packaged and prompt delivery. I love these for my mini cupcakes. They fit well in a standard size mini pan and come out easily. We will use these again. The liners are our go to for our standard size cupcakes. They fit perfectly in multiple pans and they are great in that they do not stick together. We grab the case of them at a time usually! Always gets here within 2 days! I have finally made my way to baking the popular bite-sized, mini cupcakes! I had difficulty locating the correct size however Webstaurant customer service explained how the cupcake liners are measured. Great price! Great product! I now have plenty in stock to create mini cupcakes for friends and clients! These mini-sized liners work perfectly in Wilton's mini-muffin or cupcake pans. The are the perfect height, too. Great price, 10,000 will last a long while. I think that these are great, and just getting started trying to get my name out there for a business, these are convienient to help cut costs( cheaper than other stores ) and they just look great. Big things come in small packages right? I really like how they were packaged, and they hold their shape really well. PERFECT! perfect size for small bites or individual pieces of candy and chocolates. came in one sleeve of cups, but some of the cups had come out of the sleeve and were not usable. Great product! Perfect for mini cupcake pans. Used for many bake sales and fellowship events throughout the year. Recommend this purchase to anyone who bakes more than once a year. Perfect for baking adorable mini cupcakes. I recently made an order of 150 mini cupcakes in one day and these performed perfectly. And as with most of the products on this site, the price can't be beat =). Love these liners. I hope you stay with this manufactuer on these because the last ones I purchased with the same exact item # were terible. I wasted more than I used trying to pull them apart. These are quality cupcake liners that make small size cupcakes. Important to note that they are not grease resistent and do not retain a solid white color when dark colored batters are used. These mini cupcake liners are perfect! They don't stick to the cupcake and are the perfect size for my product. Some liners don't fit the standard mini cupcake pan, but these are great! I like the size of these they are great when a big cupcakes is just to much..I also use them to make corn bread muffins and I was impressed that they stood up to the heavier batter.. Awesome!!! Perfect size for my miniture cupcakes. Very tuff liner paper and held up well doing baking and after for decorating. Will continue to order good price for product also. I wasn't sure I would like these cups but they actually turned out to be just the right size for my fudge. They are a cream color and will make my boxes look very nice! I bought these cupcake liners a while ago because it is so hard to find a baking supply store in Orlando Florida. I am very satisfied with the product and will order 10,000 next time I order. The size is perfect for mini size cupcakes especially because they are just the right size for the average plastic mini cupcake containers. Good quality mini-cupcake liners are essential for baked goods. A little thin alone, but perfect when paired with a decorated outer liner. Liners separate easily from each other for hassle-free use. These baking cups work great for mini cupcakes ro cheesecakes. They don't fold in on themselves or collapse. They fit perfectly in my mini cupcake pans. You can't find these for a better price! Much better than the top brand. They absorb the grease, which is better than the top brand which allows it to transfer through, and because the paper is thinner, separating the cups is so much easier. I used these baking cups for my Holiday Samplers this year. They are the perfect size for parties! Since I currently have six flavors to offer my customers, having an assortment pack allows people to have a taste of everything without filling up!